Home More News NOW HIRING SUMMER STAFF. 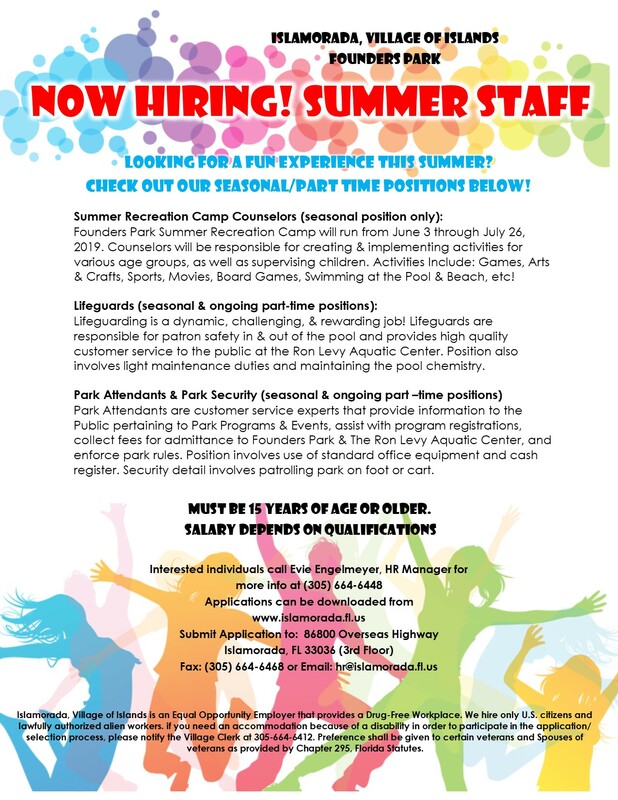 SEASONAL AND PART-TIME POSTIONS AT FOUNDERS PARK. Founders Park Summer Recreation Camp will run from June 3 through July 26, 2019. Counselors will be responsible for creating & implementing activities for various age groups, as well as supervising children. Activities Include: Games, Arts & Crafts, Sports, Movies, Board Games, Swimming at the Pool & Beach, etc! Lifeguarding is a dynamic, challenging, & rewarding job! Lifeguards are responsible for patron safety in & out of the pool and provides high quality customer service to the public at the Ron Levy Aquatic Center. Position also involves light maintenance duties and maintaining the pool chemistry. Park Attendants are customer service experts that provide information to the Public pertaining to Park Programs & Events, assist with program registrations, collect fees for admittance to Founders Park & The Ron Levy Aquatic Center, and enforce park rules. Position involves use of standard office equipment and cash register. Security detail involves patrolling park on foot or cart. or call Human Resources Manager Evie Engelmeyer at 305-664-6448 for more information.